Harloff OptimAl™ OptimAL Line All Aluminum 600 Punch Card Medication Cart is designed for exceptional use comfort allowing separate storage for narcotics and liquids. This two column cabinet features all-aluminum design with a variety of drawer types. Designed to benefit the end-user, this unit is aimed for long years of an intensive use and is backed with a 12 years warranty. All-aluminum Carts feature a wear-resistant, hard-baked powder coat finish and a vinyl bumper around the perimeter for extra protection. 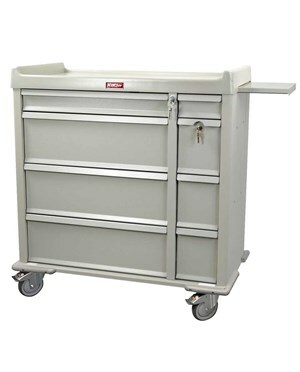 The variety of multi-purpose drawers are constructed with ball-bearing, full extension slides that provide easy access to all the drawer contents. A replaceable plastic top with integrated push handles and a pull-out shelf provide a durable work surface, 44” high. 5" ball-bearing premium rubber casters (2 with toe locking brake, 1 directional) ensure mobility and easy maneuvering. Harloff has built up a maximum security line of Medication Carts with the use of a great variety of locks options. The customer is offered to choose among three lock combinations. 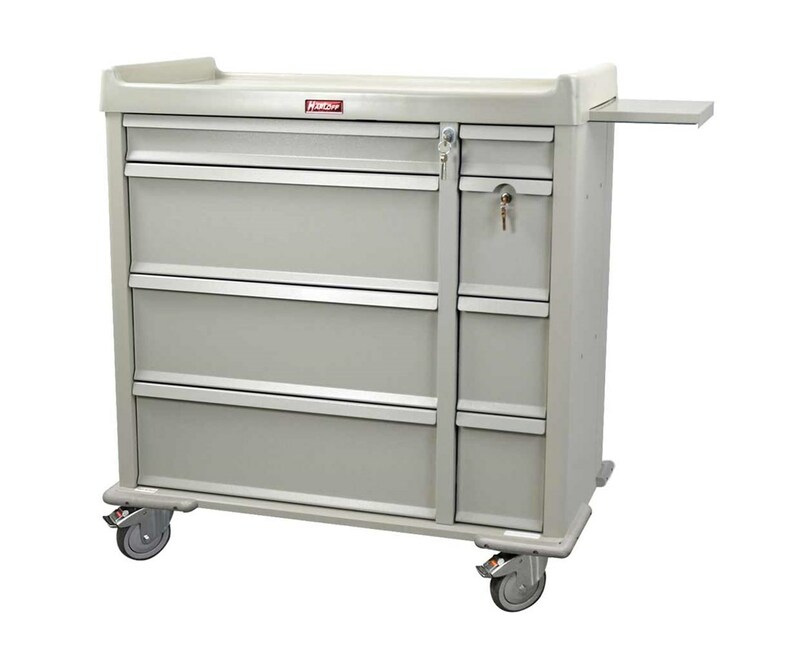 All the Cart models are assembled with a Standard Locks Set: BEST® Brand locks on drawers and Illinois locks on internal narcotics box. Separate Cart models combine the standard security set with either Basic Electronic Pushbutton Lock or a Pin Code Keypad. The basic electronic lock is very simple, in use, however adds extra comfort and perfectly fits into a busy medical environment. A pin code keypad is a versatile system with a programmable, automatic re-lock after access option. The use can set a re-lock time from 0 seconds to hours. The lock works on batteries with 1 to 2 years life capacity and a LED light on the Cart will warn the use about low battery status. Dependable in exploitation, the locks provide a secure protection for the access to the stored medications. Harloff presents 13 professional powder coat finish color choices so that the unit exterior will match and complement any facility design. To view all color options, please click Color Swatch. 3 out of 7 Cart configurations come with a specialty accessory package that includes drawer tray with adjustable dividers (#68640-P1), eye drop tray (#680551), aluminum waste container with lid (#AL680436) and a locking sharps container (#684810). To purchase your customized Medication Cart, please go to the drop down menu above and complete your online order in a few easy steps.